Graph showing numbers of pairs and fledglings over time. Between May and August, Gronant and other colonies around Britain are supervised by wardens to help protect the Little Terns. They rely on support from volunteers to construct protective fencing, minimise human disturbance through public engagement, scare away predators and constantly monitor the state of the Little Terns. Many other methods are employed to help protect the adult birds, their eggs and chicks to allow good numbers of offspring to fledge. 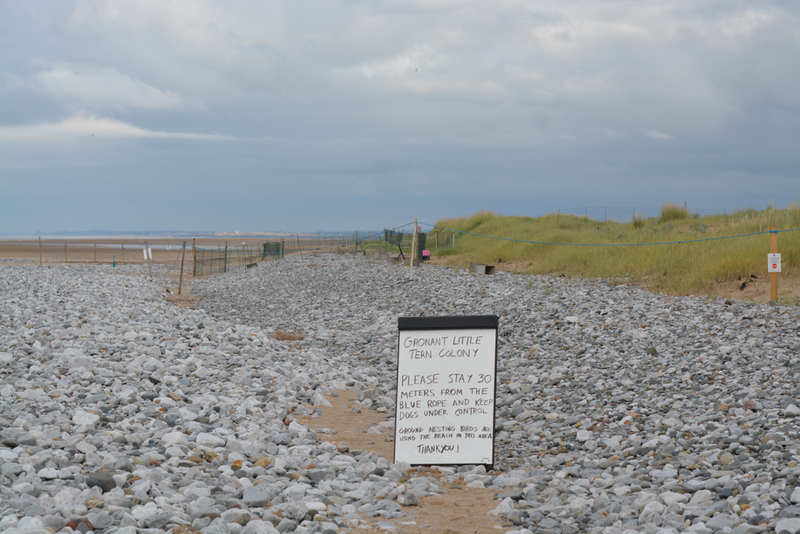 Gronant Dunes is managed by Denbighshire Countryside Service. They fund 3 full-time wardens as well as equipment in partnership with EU Life+ Nature, Natural Resources Wales, the Welsh Government and Bourne Leisure (Presthaven Sands Holiday Park). Through proactive management, Gronant has become one of the most productive Little Tern colonies in Britain. Wardening began back in the 60's by local volunteers, then in 1975 the RSPB formally began wardening the site, before passing control on to Denbighshire County Council in 2005 who have managed it ever since. The graph below shows the rise in number of pairs (the black trend line) since official wardening began and indicates that the efforts put in really are working at this site. Gronant Dunes is involved in the EU LIFE+ Nature Little Tern Recovery Project. This is a five year partnership between organisations including Denbighshire Countryside Council, and the Royal Society for the Protection of Birds (RSPB). The LIFE+ Project will standardise data collection across 20 breeding sites and enable analysis and comparison between nesting colonies involved. This information will help form a management plan to secure the long-term future of the Little Tern in Britain. The LIFE+ Project will also update the general public about the problems facing local populations of Little Terns and put pressure on statutory agencies, local authorities and policy makers in Government to help protect the Little Tern across Britain. 2018 marks the last season of this project and we will be making the most of the support this funding has given. Sign advising people they are approaching the colony.